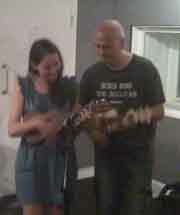 Learning and playing the Ukulele is great... Here's some of the songsheets I made to help me on that journey. Some of these songsheets I acquired from other people, so thanks and sorry I can't remember who, but most are my own work converting guitar stuff to Ukulele. Ska Special - London Ukeing. I made this a night of fun and tricky ska ukeing. Thanks Tony for the contributions. George Formby - I like Bananas : I don't know why but there's a video of me on facebook! Yes, I know some of the performers are wrong but any other mistakes let me know!